There are not too many superlatives to describe birds that make long migrations. The more you learn about what they do, the more impossible it seems. All birds face challenges during migration, and many birds routinely risk their lives to get to their ideal breeding destination or to make the trip south before their food sources disappear. In North America there are some birds who fly well over 10,000 miles per year roundtrip. Here are a couple of completely different birds who make these extreme migrations. For any birds who migrate, it is extremely important that their habitats remain intact and safe at both ends of the migration. For the Bobolink who weighs only 1-2 ounces and migrates the longest distance of any songbird, home is prairie and grasslands. After 6,000 miles of flying one way (a round trip total of 12,000 miles) from South America, this beautiful bird with the cheerful, bubbly call, breeds and nests in the US. Natural grasslands, where Bobolinks would naturally nest, are disappearing at a rapid rate, so they often nest in managed hayfields. But, hayfields are being harvested several weeks earlier than they have been historically as farmers can get an additional seasonal crop this way. Often this is happens when the chicks are not yet able to fly, and they are killed by the harvesters. 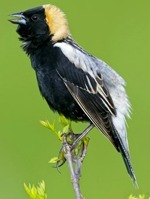 Many farmers like Bobolinks for their voracious appetite for insects. Some farmers with Bobolinks nesting in their fields wait until the chicks fledge before they send out the combines, or avoid areas where they are nesting until the chicks are gone, but not all farmers will do this. In their over-wintering grounds, South American rice farmers consider them a pest and often target them. And there they are also faced with toxic chemicals like DDT used to control insects, but which have been outlawed in the US due to their high toxicity to wildlife and humans. But the biggest challenge facing Bobolinks is disappearing grasslands and prairies. 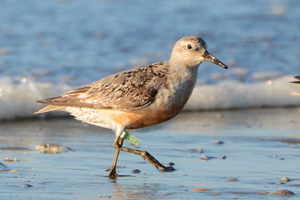 One of the superheroes of migration is the Red Knot. Against all odds this amazing shorebird flies over 18,000 miles roundtrip each year. Some flights are over water for days on end – in fact some red knots fly round the clock for over a week over open water without stopping – with no sleep and no food! How do they do that? Long distance migrators have to put on a lot of extra weight in order to make it through that amount of time flying – sometimes they make themselves so fat they can barely get off the ground! But they need the extra weight to get to the next stopover which may be thousands of miles of non-stop flying away. Often they time their arrival at stopover locations to when a food source becomes available. 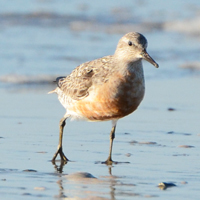 Red knots, for example, time their arrival in Delaware Bay, a major spring stopover for them, on the arrival of horseshoe crabs coming onshore to lay eggs in late May. The knots often land at the same beach each year at precisely the time the horseshoe crabs start egg laying and they scarf down these eggs. The crabs will lay millions of eggs — enough so the Knots can get the energy they need to fly onwards and the horseshoe crabs can keep their numbers up. Knots need the nutritious eggs for food right then as they are exhausted and skinny from flying. But in recent years, people have been killing a lot of horseshoe crabs for bait and fertilizer. Because there are a lot less of these crabs to lay eggs, the number of Red knots has plummeted 80% in a very short period of time. Some states have made it illegal to kill horseshoe crabs, and this has helped Red knots come back in these areas. But not everyone agrees with this and there is a lot of pressure for these bans to be lifted. This is a case where the future of one bird, the Red knot, is very dependent on the survival of just one other animal, the horseshoe crab. These are just two examples of extreme migrators – birds that push the limits to move between their winter and summer homes twice pr year and do it on a very precise timetable. Want to help these birds? Check out our blog and get inspired!